Glenboggin | We're not leaving and you can't make us! We're not leaving and you can't make us! In a stormy Cooncil meeting last Thursday evening, members voted overwhelmingly to find out more about this 'BREXIT' thing that a passing 'lost' walker was going on about. It came to light that apparently no-one in the Cooncil even knew there was a vote or that they were part of the EU, but... on having discovered that they were, there was a 100% vote in favour of staying in (someone mentioned grants). As such, Cooncil chair, Dougie Hoots-McLafferty suggested they send a pigeon to Wylie and Wylie solicitors instructing them to immediately do three things. First, to find out more about this EU thing and to gain as much information as possible about special infrastructure grant aid for small communities. Second, to inform the UK government that no-one was messing with Glenboggin's right to stay in the EU, something they suggested should be written in capital letters. 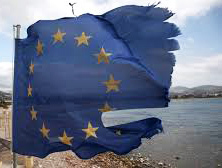 And thirdly, to raise an EU flag on the shores of Loch Boggin as a show of support and... to do this as soon as possible (apparently one of the cooncil members thought they might have something like that in their chicken coop). The meeting closed with the usual singing of the Glenboggin song 'To be a Glenbogger is to be a Glenbogger' which is regularly sung at the annual goat throwing contest and of course, at other times to show solidarity with some cause or other (unspecified, although, drink is often involved).